Background: Considering the economic loss by columnaris disease in fish, a rapid, simpleto- use and visual detection technology for the detection of Flavobacterium columnare (F. columnare) is very important. Methods: This assay utilizes LAMP for F. columnare-specific target gene amplification, and the resulting LAMP amplicons were further analyzed by Immunochromatographic Strip (ICS) for the rapid visual detection of F. columnare. The performance of such method includeing specificity, sensitivity, repeatability and practical use were validated. Results: This assay demonstrated high specificity, repeatability and has a limit of detection of 2.5 × 102 F. columnare CFU. The reliability of this assay was further confirmed by the equencing and alignment of LAMP amplicon with the DNA sequence of F. columnare. The whole detection process was less than 50 min. Conclusion: The LAMP-ICS assay presented here is simple, rapid, and reliable. Moreover, it could be easily adapted to detect other fish pathogens, and it may be more suitable for future use in the resourcelimit region for the detection of fish pathogen on site. 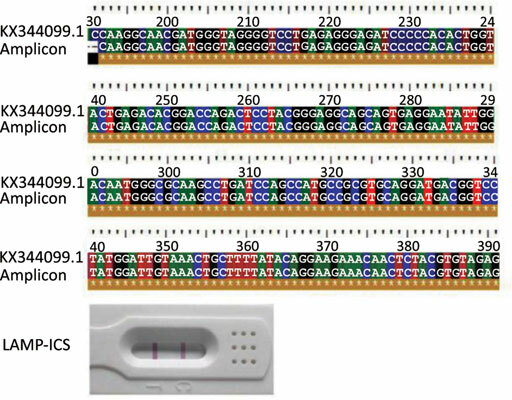 Loop mediated isothermal amplification, immunochromatographic strip, Flavobacterium columnare, fish pathogen, visual detection, PCR.